Rose Color: White, Pink Rose Bride: Anthy Himemiya Sword: Shinai, Sword of Dios, Rapier (Anime) Drive to Duel: (progressively) the desire to protect Anthy. 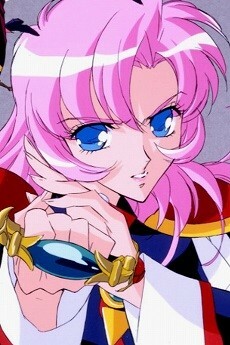 Blood type: B Myers Briggs personality type: ESFP Birthday: December 29 In all versions of the story Utena is a tomboyish, courageous and naïve character who lives to emulate the idealized prince figure from her childhood. She is forthright, honest, and friendly, and nearly all the girls in school adore her. In the manga series, her parents died when she was six years old. On that day she was wandering around, lost, and she fell through a hole in a fence that enclosed a river area. Utena nearly drowned but was saved by a mysterious Prince who kissed away her tears and told her that if she did not lose her noble heart, they would meet again. He left with her a rose signet ring (the Rose Seal as it is called by the duelists). Later on, Utena receives picture cards that give her clues as to where her prince is. By following these clues, she finds herself at Ohtori Academy. In the anime, the initial story the anime presents is almost identical to that of the manga, except with more detail. Flashbacks show the young Utena climbing into a coffin upon her parents' deaths, seeing no point to living. She encounters the Prince, and — for reasons which eventually become key to the show's resolution — this encounter created in her the drive to become a Prince herself. Utena does not remember much of this encounter, and for the most part Utena herself does not clearly remember the full details of her history, until the very end. In both the anime and manga, Utena accidentally becomes a Duelist and wins Anthy as the Rose Bride. Though critical of the Duels for objectifying Anthy, her honest desire to protect Anthy as a well as a drive to act like a prince lead her to become an active participant. As the series passes, her nobility is continuously tested, until she is finally forced to confront her own hypocrisy. In the movie, Utena travels to Ohtori Academy after supposedly breaking up with her past boyfriend Touga. It is also assumed that after her seperation with Touga she was in an emotional turmoil that led her to the academy. However, she sees him on her first day on campus. Her hair is cut short, giving her more of a male's appearance, causing Saionji to initially mistake her for a boy. Additionally, Utena is a more bisexual character in the movie being coquettish with Wakaba and does not seem to mind her more boyish appearance. She is extremely troubled by Touga's apparent abandonment of her, and her interactions with Anthy express a level of introversion not present in the anime series, though she also shows an unpredictable streak and is once physically violent towards Anthy in anger. This is said by fans to be Utena's adoption of a more masculine personality. Initially Utena's aim to be a prince is more subtle than prominent compared to the anime series. It is Touga's supposed abandonment of her that caused her to feel that she must be more idependent and a "prince" by nature. Though she states that Touga was always the prince she wanted the movie deals with her own metamorphosis in becoming a prince. Many fans noted that Utena and Anthy seemingly swap personalities in the movie, and that Utena is the one who must be saved by Anthy. Their physical appearances also seem to mirror their respective series incarnations(seeing that Utena has wavy hair and Anthy has straight hair which was the opposite in the series).